GALION — Together We Hurt Together We Heal will host its eighth Community Care March on Saturday, Nov. 3. The march is in a different Crawford County each year. This year’s march is in Galion. One of the goals of Together We Hurt Together We Heal is to bring education and support to area communities regarding addiction and the impact this disease has on each and every one of us. The Galion will start 8:30 a.m. at the Big 4 Depot, volunteers with Together We Hurt Together We Heal will be handing out T-shirts to participants. At 9 a.m., there will be a welcome program and volunteers and participants will receive an official thank you. There also will be a prayer asking that the projects of Together We Hurt Together We Heal can continue. The walk to then leave the Big 4 Depot and march west on Harding Way West to First United Church of Christ. If some participants have difficulty walking long distances, there will be transportation available..
Sarah Thompson, of the Ohio Citizen Advocates for Addiction Recovery, will be the guest speaker. Two moms in our community, Tammy and Ginny, have agreed to share their recovery story. To end the program, there will be mini support group meetings. Representatives from AA, NA Alanon and Celebrate Recovery will be there to provide help and information at these meetings, which will last about 15 minutes. The meetings will allow participants to gain a basic understanding of the support group and maybe help alleviate some of the fear in attending a group for the first time. Refreshments will be served. Sponsors are being sought for each of the events. Each sponsor will have their business/agency/organization name on the T-shirts. Together we Hurt Together We Heal is seeking sponsors for its 8th Community Care March. 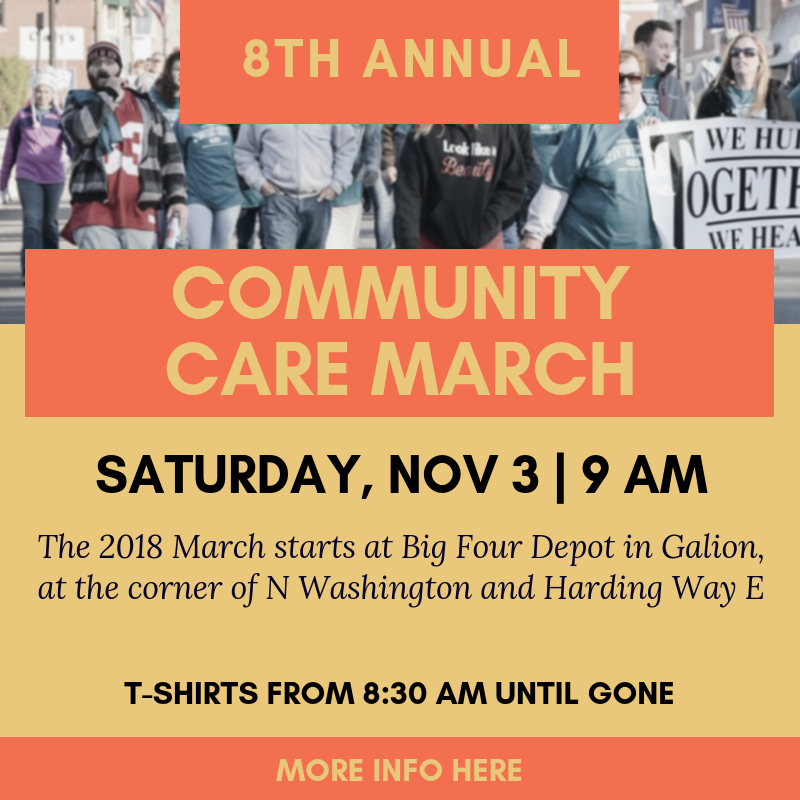 The march is Nov. 3 in Galion. Donations of $100, $200 or $300 — or any other amount — are welcome and sponsors’ names will appear on t-shirts being made for the event. The deadline to be a sponsor is Oct. 19. Donations are tax deductable.